My morning reading is an article by the Deputy Mayor of Paris on how they brought their water service back into public control. It has a particular relevance for Scotland because of the business led campaign to privatise our water. Water in Paris was privatised in 1985, although initially it was put into the hands of a public/private company. Within 2 years the production was in the hands of private water companies. A stark warning to those who may think that mutualisation is an attractive option for Scotland. As with Welsh Water, mutualisation in this capital intensive industry is always a cosmetic introduction to privatisation. The article shows how the private companies increased their profits at the expense of the Paris water charge payer. Back in democratic control, charges have been frozen and profits are coming back to the public purse. Whilst Paris is not an exact model for Scotland, there are important lessons we can learn about the importance of democratic control. The Tories are apparently making mutualisation a condition of their support for the coming Scottish budget. Have they become somewhat late converts to the co-operative movement? I think not. They know that once out of direct public control the service slips quickly into the hands of the multi-national water companies, as happened in Paris and Wales. Our message remains. Scotland's water is not for sale! Three police forces - Strathclyde, Dumfries and Galloway, and Central - have this week proposed swingeing service cuts by removing hundreds of staff jobs as well as slashing the number of front line police officers. Whilst the budget cuts are real, I suspect some Chief Constables are exploiting their limited powers to cut police officers, in order to return to a 1970's police force, before the widespread introduction of civilianisation. They argue that police officers are more flexible because they can be deployed anywhere. This is simply lazy management. Police officers are not trained to carry out the range of specialist tasks in a modern force. In addition this 'flexibility' comes at a price. Taking trained operational police officers off our streets to perform administrative tasks, at greater cost, is economic madness. Imagine an engineering team in a construction company. Of course it is more 'flexible' if the whole team are Chartered Engineers. But no company could run a business like that. So they have a balance between engineers, technicians and support staff. Every modern organisation understands this - except it would seem some (but in fairness not all) Chief Constables. Police staff are a vital part of modern effective policing. Scotland has made progress in "police civilianisation" in recent years but still has some way to go to catch up with the situation in England and Wales. UNISON Scotland's Briefing on Police Civilianisation in Scotland shows that Police staffs comprise 28% of all police personnel in Scotland. In comparison, the figure for England & Wales is 32%. Strathclyde Police is having to make the biggest cuts, partly because it has been the slowest to modernise. We need our police staff to keep the uniformed officer on the front line - where the public want them to be. Another hole blown today in the Con-Dem Government's claim that the emergency Budget is progressive. This time by the Institute for Fiscal Studies. Their report concluded: "Once all of the benefit cuts are considered, the tax and benefit changes announced in the emergency Budget are clearly regressive as, on average, they hit the poorest households more than those in the upper middle of the income distribution in cash, let alone percentage, terms." It also appears that the Treasury failed to do an equality impact assessment on their measures, as required by law. The Treasury minister being interviewed on Radio 4 this morning was desperately trying to avoid answering this question - and doing it very badly! There is a very good analysis on the impact of benefit cuts in this month's Labour Research. This shows that the consequences of switching uprating to the Consumer Prices Index (CPI) alone will cut £5.8bn from benefits over the next five years. For example, if Carers Allowance had been uprated by the CPI rather than the RPI, carers would be £270 a year worse off. Today is National Slavery Memorial Day and UNISON is working with Anti-Slavery International to both honour the struggle of slaves for freedom and to continue the fight against racism and exploitation today. The transatlantic slave trade was one of the most horrific crimes in human history, with well over 10 million people forcibly transported and subjected to utterly inhuman conditions. Several million people were directly murdered and hundreds of millions of people lives remain affected by the legacy of this terrible crime. Slavery Memorial Day helps to educate us all about one of the most odious episodes in history, and illustrate the horrors which gave birth to the poison of anti-Black racism. Some people argue that such memorial days serve no purpose. I would argue that this view is misguided. For example Holocaust Memorial Day has played an extremely valuable role not only in marking the holocaust itself but also in educating new generations, and challenging anti-Semitism. I hope a growing number of organisations will raise awareness of National Slavery Memorial Day and try to promote what people can do to get more involved. Saturday was a full meeting of Labour's Scottish Policy Forum. This was a first opportunity to debate the large number of submissions to the second stage consultation paper 'Ideas for a Fairer Scotland'. And there were plenty of ideas in the hundred plus submissions from all sections of civic society. It is one of the unsung benefits of devolution that Scotland has a thriving political culture in which organisations engage with Parliament and the political parties. Our democracy is much stronger as a result. Underpinning the debates on Saturday was recognition that if Labour wins next year's election it will be facing a very different financial position from the one when we started this policy process. However, it is also important that we don't miss the opportunity to articulate a different economic approach to that of the UK Con-Dem coalition. The UK cuts are much greater than required and are driven by an ideological drive to reduce the role of public services. Labour in Scotland has always rejected that approach and we should clearly set out our values in that election. I was speaking at a meeting in Glasgow this evening in support of Ed Milliband for Labour Leader. UNISON has nominated him and is supporting his campaign. He articulated a very clear vision for Labour under his leadership. One of the criticisms of the campaign has been the claim that the candidates (other than Diane Abbot) are all very similar. Tonight I got a very clear idea how he is differentiating himself from the other candidates. In particular he recognised that New Labour has had its day and that the party needs to rebuild, based on values that our natural supporters would recognise. He answered a range of questions from the floor, including several very specialist ones. He handled that well and had a good grasp of the issues you would expect to come from a trade union audience. In all a polished performance and I left feeling that we had made the right choice. Whilst his brother may be the favourite, I suspect he is likely to pick up a lot of second preference votes that could see him come from behind to win. I was at a meeting of the Scottish Labour Party's Health Commission last night. Under the policy process the Commission is tasked with drafting the health section of the the party programme for consideration by the Scottish Policy Forum and then Party Conference. The second stage consultation ended at the end of July. Over 100 submissions have been received and many of these cover some aspect of health policy. I stress health policy, not simply NHS Scotland. In view of the debate in England over the ConDem health reforms, what strikes me about the submissions is that virtually no one is arguing that we should copy these in Scotland. Not even a line of support for the more modest New Labour reforms that have been introduced in recent years. In Scotland there is a very broad consensus that the NHS is about collective provision and that competition has no place in that ethos. That is not to say that our model cannot be improved. There are difficult issues to be addressed around better integration of health and social care; how personal care can be person centred without the difficulties of the direct payments approach; and how we can finance improvements to the NHS estate. However, important though these issues are, we must not lose sight of health inequality as the number one cause of poor health in Scotland. We need to focus on the poverty and inequality that underlies poor health. Inadequate housing, low confidence and wellbeing, low pay and unemployment all impact on health. This is evidenced by the fact that children from poor backgrounds are more likely to leave school with no positive destination and this also affects their health. Furthermore, smoking, poor diets, excessive alcohol intake and drug use are more prevalent in areas of deprivation. We therefore need to take co-ordinated partnership working across policy areas if we are to make a real impact on Scotland’s most persistent health problems. A very welcome intervention today from the Leader of Glasgow City Council calling for an end to the Council Tax freeze. This is something UNISON Scotland has long argued for, because continuing the freeze will add to the scale of damaging cuts to services around the country. Local authorities should be able to raise funds through the council tax. Using the tax system is much fairer than raising charges for services. Charges hit those on low incomes hardest and the council tax freeze benefits the wealthy disproportionately. Whilst many leaders have voiced their concerns over the Council Tax freeze privately, Gordon Matheson is the first to speak out. In the current financial climate, a tax freeze is simply not viable. I spent Sunday morning doing a couple of sessions at our new pilot course on trade unions and politics. The course was well received by the participants, who assisted with a detailed evaluation. The course was oversubscribed, which is in itself a good indication that there is a growing understanding that politics matters. Converting an interest in politics into practical political activity is yet another challenge. Although with the Labour Party recruiting nearly 30,000 new members since the election, maybe there is some progress here as well. Those of us brought up in a political environment often take it for granted that others understand politics, particularly in the trade union movement. However, when you talk to members and activists, it's obvious that we need to do very much more to educate members, to enable them to make a greater contribution to political debate. We are therefore looking at how we can include shorter versions of this course into other training, or deliver a shortened version at local level. This type of training, together with our communications, can help develop a better understanding of the impact politics has on our members jobs. It can also raise awareness of how trade unions can influence the political process and build greater member engagement with our campaigns. Yesterday I attended a gathering of organisations campaigning to end discrimination and take practical steps to improve the lives of probably the most marginalised and discriminated community in Scotland - Gypsy Travellers. This community can trace their Scottish origins back to at least the 15th Century. Sadly their persecution and discrimination is also as long standing. For a good summary there is a current E-Petition by Ken MacLennan gathering signatures on the Scottish Parliament website. There is a clear understanding of the problems facing the Scottish Gypsy Traveller community and a concern over the lack of action by governments. Less clear is the apparent reluctance of the EHRC to take action on these issues. There was a broad agreement that co-ordinated action is required across government departments and other public bodies. This could be facilitated by a Scottish Government task force that should include representatives from the community. Whilst there are many areas that need action, organisations recognised that we need to prioritise. Key areas include housing, education, health, public awareness and access to legal services. There are also problems with reserved matters like Job Centres and the role of the EHRC. From a UNISON perspective we recognise that many of our members interface with the Scottish Gypsy Traveller community. Many members are unaware of the issues facing the community and the legal framework. We are therefore considering commissioning an advice booklet to assist members and raise awareness of the very real problems this community faces. 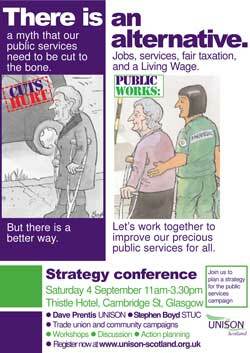 This week we launched our Public Services Strategy Conference to be held on Saturday 4 September in Glasgow. Speakers include UNISON General Secretary, Dave Prentis and Stephen Boyd from the STUC. There will be workshops with an emphasis on action planning to take the campaign forward. If you want to attend you can register on the UNISON Scotland website. The Herald is running an interview with SFT Chief Executive Barry White that highlights that the Scottish Futures Trust would still use PFI. Perhaps the only real surprise here is that The Herald thinks that this is a new revelation. The SFT has been developing PFI schemes from the outset. The Hub initiative is a direct copy of the English LIFT PFI scheme. The so called Non Profit Distributing (NPD) model is also a PFI scheme, with plenty of profit returned to the commercial partners. If you put a former PFI advisor to run the SFT and a private finance banker to Chair it, you shouldn't be surprised if they stick with what they know. And that's PFI. A rare experience today of commenting favourably on an article in the Daily Express! This story also highlights the importance of good pension schemes. Public sector workers save year in, year out for their pensions, but most private sector workers are denied this opportunity. Individuals are faced with very complex pension choices and end up with plans that charge high fees, are inefficient and underperform, leaving them not enough money to live on when they retire. This is the real pensions apartheid that the government should be tackling instead of attacking the so-called ‘gold-plated pensions’ enjoyed by public sector workers such as social workers, nursery nurses, classroom assistants, care workers, nurses and paramedics. The real pensions scandal is how the country will afford to look after the people who have not saved, or not saved enough for their retirement and then need means-tested state benefits. Our full response can be viewed on our website. Back from holiday and straight into a BBC phone in on the 'Independent' Budget Review. This report is a predictable rehash of the business agenda from the usual establishment suspects. In fairness their remit was limited to implementing cuts, without any serious consideration of alternative strategies. One aspect that is getting a particular media focus is the ring fencing of the NHS budget. In fact the ring fence doesn't actually add up to the claims that the 'health budget will be protected'. The most that is protected is the Treasury's notional inflation figure, that this year stands at 1.5%, when actual inflation is nearer 5%. Health inflation is even higher because of spiralling drugs pricing and the cost of PFI schemes, amongst other costs. We also need to recognise that health spending and the NHS budget are not the same thing. Many other aspects of public spending have an impact on health. Not least social care, which if not available, will simply block up beds in NHS hospitals. Even the 'protection' of NHS budgets is being whittled away. It is noticeable that ministers at UK and Scottish level are now talking about protecting 'front line' services. This is one of the most abused phrases politicians come up with when implementing cuts. It plays to widespread myth that the cuts can be made on non-essential bureaucracy. In fact health staff are a team and cuts in support staff simply shift administrative and other functions onto other staff, detracting from patient care.